So tonight as I stalk many different blogs, I'm feeling a bit jealous of my teacher buddies who mention they're already finished with the current school year or they have less than 10 days left. After tonight I only have one Sunday night left to prepare for the week. Whoo hoo!! 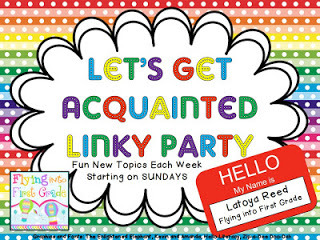 I decided for the first time to join the Let's Get Acquainted Linky Party given by Latoya Reed. This weeks topic is about blogging buddies. I appreciate all the help and support I've gotten from you all. So many talented teachers out there. I truly believe that teaching is a true gift given by God. The reason being for choosing Erica is because not only is she an OUTSTANDING blogger. She's VERY humble about it. She has awesome ideas and is always sharing. Erica will do her best to reply to any question or comment. Not saying she does and I don't expect her to, because you really have to have no other life but blogging if you had to respond to every comment received. Thanks Erica! You rock! 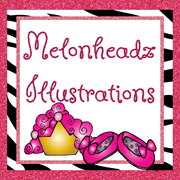 The reason for choosing Nikki at Melonheadz Illustrations is because her clipart is soooooooooooooo stinkin' cute! I love clipart and I have favorites, but I must admit her's is by far my most favorite. I enjoy her creations and look forward to using more of them for future product creations. Found your blog through Latoya's linky party. I'm a new follower. Can't wait to read your posts! I found you through the linky party and see that you are from Houston Texas! I have a ton of family there...although I live way up here in Toledo! Excited to link up with a fellow first grade teacher! I am a new follower and I look forward to reading more! I'm so glad you found me Julie! Thank you for the follow. I can't wait to stop your blog now. You have a FAB week as well.